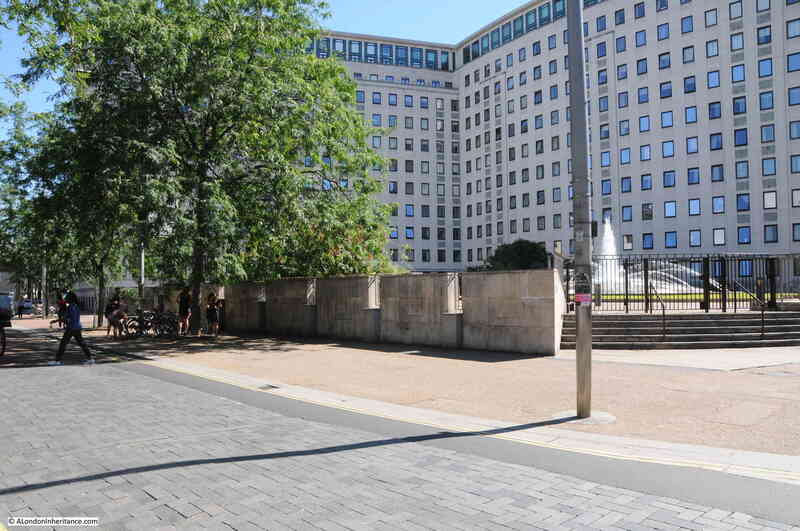 The area on the Southbank between Waterloo Station, the Thames, Waterloo Bridge and County Hall has seen considerable change over the last 70 years. Originally the location of industry and closely packed housing, post war the streets and buildings were almost completely erased and the Festival of Britain was built on the site in 1951. Following the end of the Festival, the Royal Festival Hall remained with later additions including the Hayward Gallery and Purcell Room. On the area between Belvedere Road and Waterloo Station, Shell Centre, the UK head offices of the Royal Dutch Shell oil company were built, consisting of a tower block and upstream building to the west of Hungerford Bridge, with a downstream building to the east. The downstream building of Shell Centre was converted into flats some years ago, and currently the wings around the tower building are almost fully demolished ready for the construction of more residential towers (see my post covering a walk round the Shell Centre viewing gallery for more information). 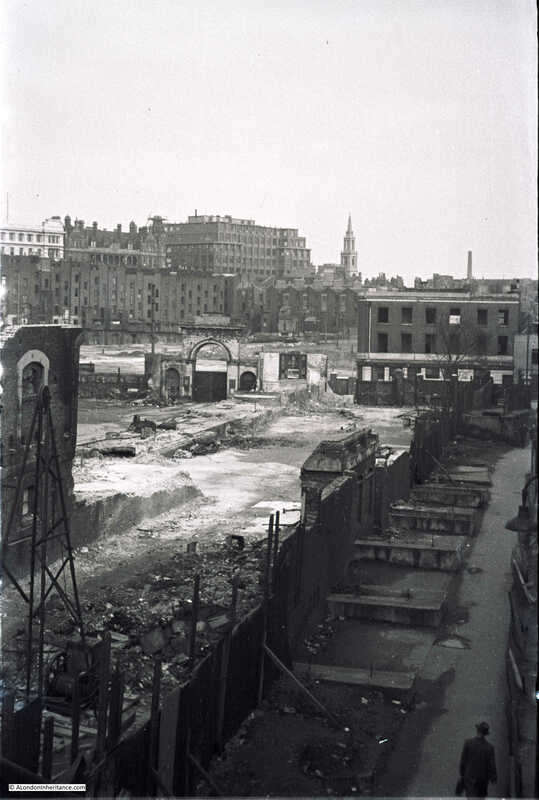 My father took a number of photos of the area just after the war and during the building of the Royal Festival Hall. I have already covered posts on Building the Foundations of the Royal Festival Hall, the South Bank before the Royal Festival Hall, Construction of the Royal Festival Hall, and Sutton Walk. Scanning through negatives, I have since found additional photos of the area and I feature these for this weeks post. The map below is from the 1940 Bartholomew’s Atlas of Greater London and I have marked the locations and directions of view of this week’s photos. The following photo is from position 1 on the map and was taken from the end of the footbridge that ran alongside Hungerford Railway Bridge. 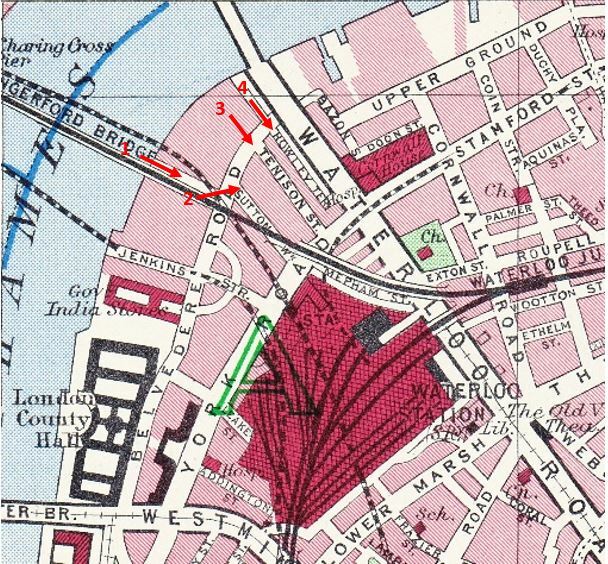 The Lion Brewery is on the left and the railway into Waterloo East and across the river to Charing Cross Station is on the right, with Waterloo Station being the building on the far right. The buildings at the end of the road alongside the railway are along Belvedere Road. The building with the white lower level is a pub, however I have been unable to confirm the name, there were a number of pubs along Belvedere Road but I cannot find the name of this one. Sutton Walk is to the left of the pub. Enlarging the photo, the building to the right of the pub has the name “Westward Ho” on the sign above the ground floor door and window. Not sure what this was, however in the Survey of London volume for the area there is a drawing of the building, the online page can be found here. Unfortunately, the Survey of London does not shed any light on the name of the pub. It does confirm that these buildings were numbered 116 and 118, the only pubs I can find were the White Hart at number 35 and the Green Dragon at number 68. The Royal Festival Hall now occupies the area on the left and the whole scene has changed dramatically. Standing on the end of the new footbridge alongside Hungerford Bridge, I took the following photo. My father visited the area again as demolition was taking place. This must have been around 1949 as this was the time when the area was being cleared ready for construction of the Festival of Britain. The following photo is from the same position on the end of the Hungerford Bridge footbridge and is looking slightly to the left of the above photos. 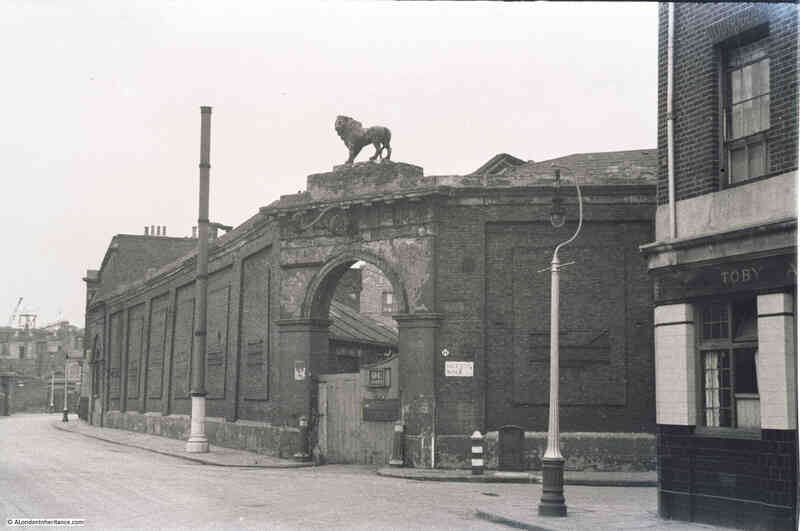 Much of the Lion Brewery has now been cleared with only the entrance arch to Belvedere Road remaining. It also looks as if the pub has been gutted with empty windows now looking out onto the area. The tall buildings in the background to the left all remain to this day. The church is St. Johns at Waterloo, the building to the left of the tall office block is the old Royal Waterloo Hospital for Women and Children. I featured the following photo in my post on Sutton Walk. This was taken outside the pub with Sutton Walk running off to the right and part of the Lion Brewery directly opposite. 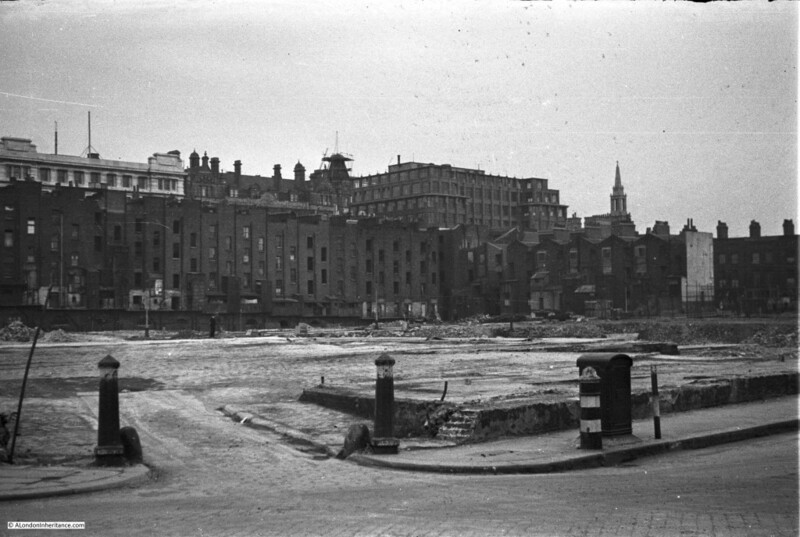 I have repeated this photo as the following photo was taken from roughly the same position after the brewery buildings had been demolished. The bollards confirm the location. This is looking from point 2 on the 1940 map. The buildings that edge the open area are houses that ran along Howley Terrace. 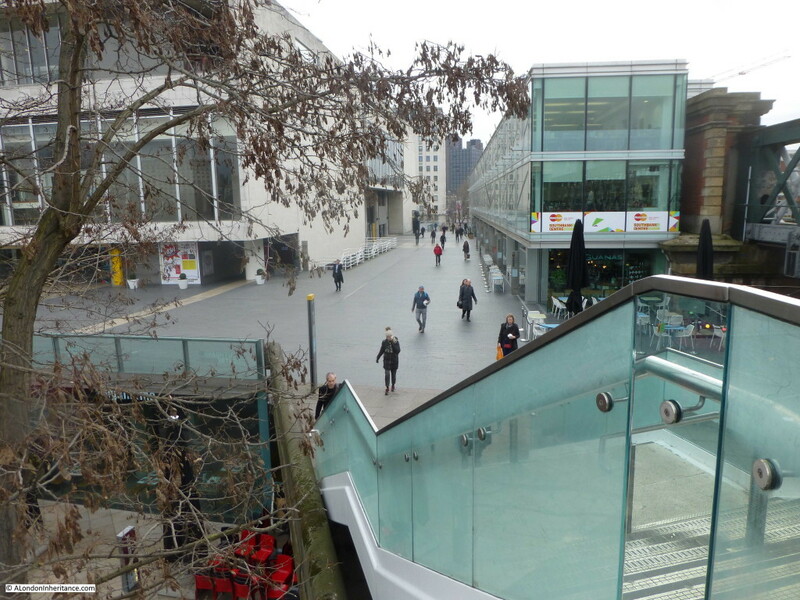 Sutton Walk has changed location, however the following photo was taken from roughly the same location and looking in the same direction. This whole area is now occupied by the White House Apartment Building (the old Shell Centre Downstream Building). 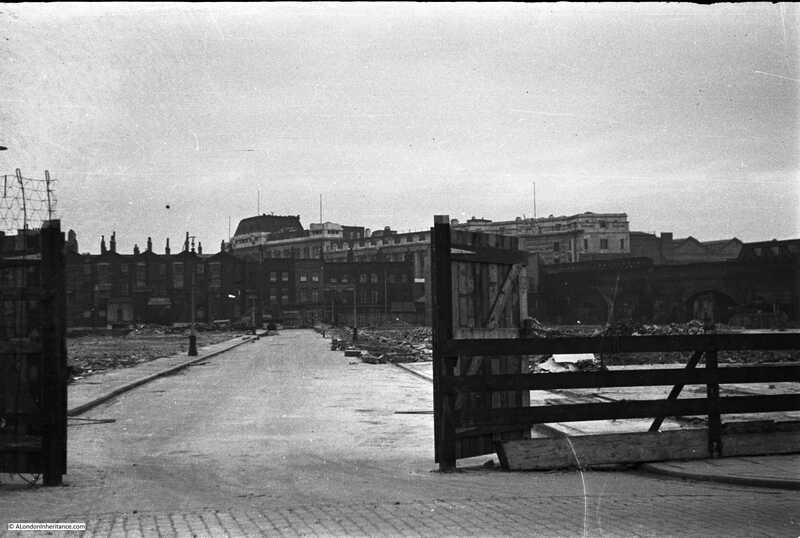 Moving along Belvedere Road towards Waterloo Bridge, the following photo is looking along point 3 in the map, along what was Tenison Street. The buildings have all been demolished but the road, pavement and street lamps remain, however they will also soon go ready for the Festival of Britain. 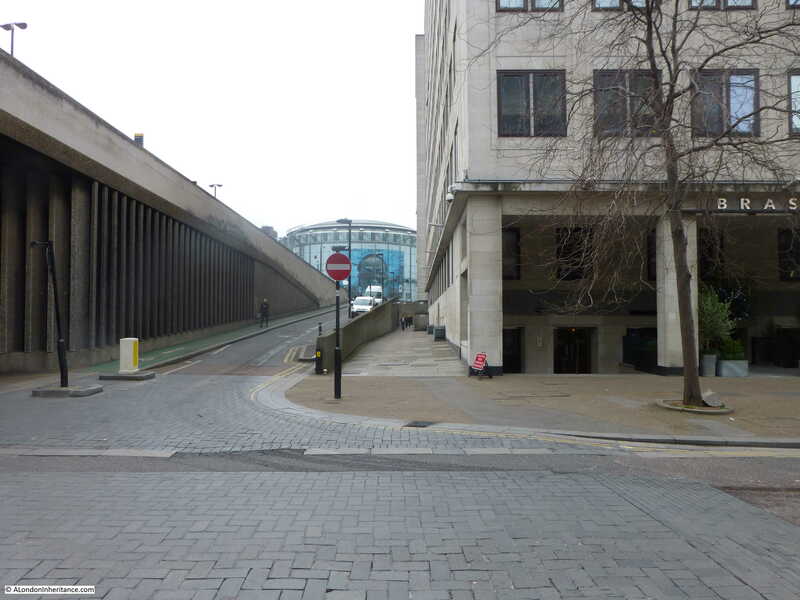 It is difficult to get the precise location today as the White house building obscures the view of Waterloo Station, however I took the following looking in the direction of where I believe Tenison Street ran. As I covered in one of my earlier posts on the area, many of the roads in this area were named after Archbishops of Canterbury. Tension Street was named after Thomas Tenison who was Archbishop of Canterbury from 1695 to 1715. Move a bit further along Belvedere Road, and the following photo is looking along Howley Terrace (view 4 in the above map). 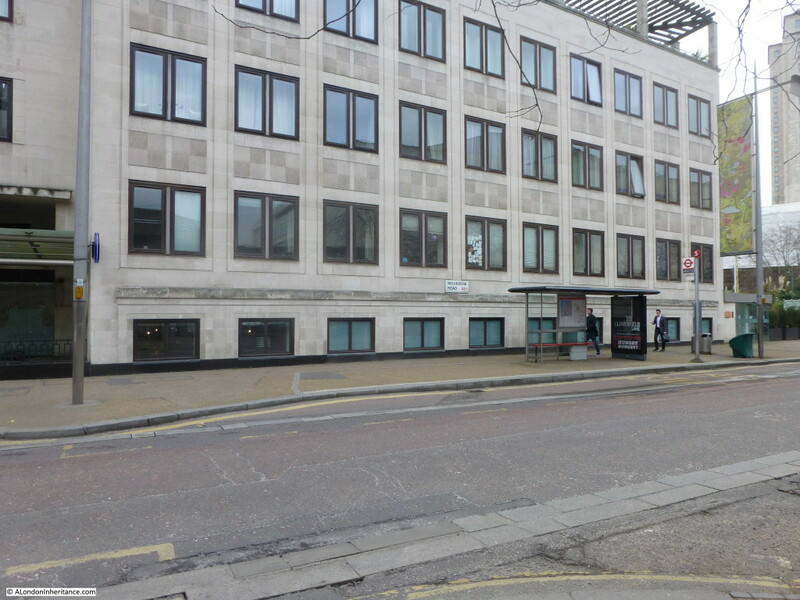 The approach road running up to Waterloo Bridge is to the left of the photo hence the large advertisement on the side of the building to catch the eye of those travelling across Waterloo Bridge from the north to the south. As part of the reconstruction of the area, a new approach road was built up to Waterloo Bridge. This approach road covered some of the area occupied by most of the housing on the left. Today, at the end of the approach road to Waterloo Bridge, at the junction with York Road and Stamford Street is a large roundabout which covers the space occupied by the houses at the very end of Howley Terrace. The following photo is looking along the same view today. Remarkable how the area has changed. The original buildings along Howley Terrace (named after William Howley, Archbishop of Canterbury from 1828 to 1848) were crowded, multi-tenant housing with very basic facilities. Apartments in the White House now sell for between one and three million pounds. “The Lion Brewery has always been associated with a famous crime. In 1872 Dr. W.C. Minor, who had been a surgeon in the American Civil War, and on a visit to this country, was staying at 41 Tenison Street, shot a stoker, an employee of the Brewery in Belvedere Road. At the trial, he was found guilty but insane. From Broadmoor criminal lunatic asylum, where he was confined, he contributed between five and eight thousand quotations to Sir James Murray’s famous Oxford English Dictionary, and his name will be found in the acknowledged assistants to that great work. Kent also states that during the preparation of the site for the Festival of Britain, sixty men used 93,000 tons of demolition material to build the river wall which is 1,691ft long, so it is interesting to think that as you walk along the Southbank, next to the Thames, you may well be walking on all the materials that once made up the brewery and houses that occupied this area. It is fascinating to walk around the Southbank with the photos from this and previous posts on the area. I can now build up a detailed photographic record of this small but fascinating part of London. I plan to bring these all together in a future post for a detailed walk around the area covering before, during and after the Festival of Britain to the current day. This entry was posted in London Streets and tagged Howley Terrace, Hungerford Bridge, Royal Festival Hall, Southbank, Sutton Walk, Tenison Street on March 13, 2016 by admin. I hope that you will be taking a look at the small area around Roupell Street at some stage. Your blog remains one of the best London History sites on the web. 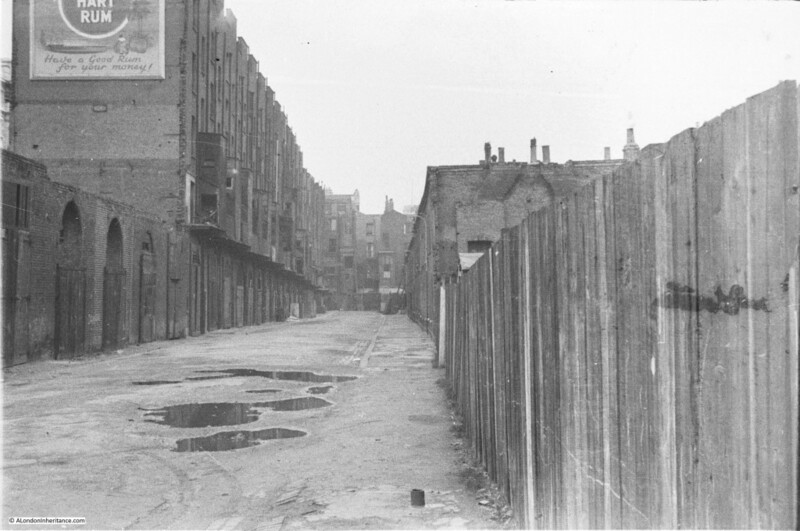 Wonderful photos of the area before the building of the Festival of Britain site. The 1949 film ‘Night and the City’ has a great sequence shot in this location. Richard Widmark can be seen running out of Howley Terrace and along Belvedere Road. Chased by a gang of criminals, he takes refuge in the Shot Tower where a hand to hand fight ensues. I do a talk with clips from this and other films shot in the area in the late 40s/early 50s showing how the area has changed. With your kind permission, I would love to include some of the stills from your website in my talk (with due credit of course). Another fascinating post. Many thanks. The pub was the York Hotel, Nos. 3-7 York Road. The address of the little house next door was 9 York Road. It’s worth Googling this address, it used to be a variety or literary agent (search on ‘9 York Road, Lambeth’). 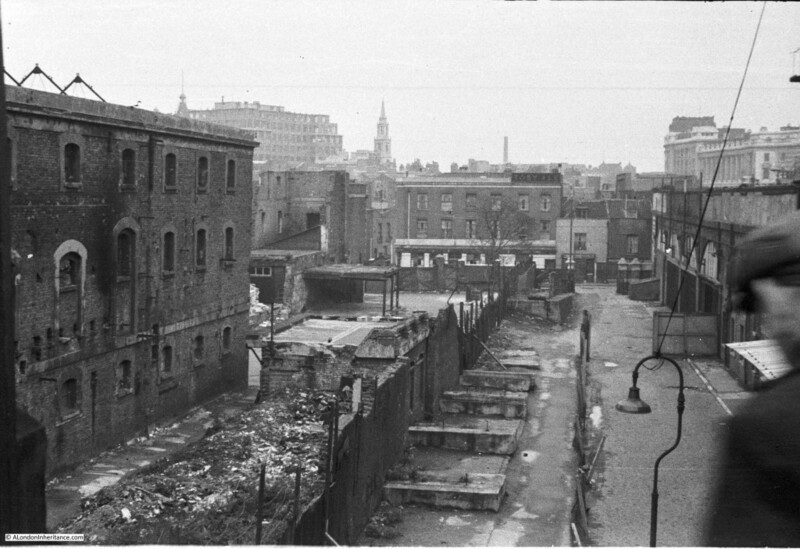 The photograph showing the demolition from Hungerford Bridge – “The tall buildings in the background to the left all remain to this day.” Those buildings are at the end of Stamford Street. Stamford Street itself had a number of very large buildings, notably the London HQ of both Boots and Sainsbury’s that were next door to each other. The site is now occupied by Kings College. I worked in the Boots building during three summers in 1967 to 1969. The frontage onto Stamford Street was occupied by the offices and the great mass of a building across the courtyard behind was the warehouse. It was a brute of a building with several storeys and small windows and a constant security problem. In a heat wave it was unbearable – my Nigerian co-workers wilted in the heat and longed for the climate of Ibadan! When I moved to Lancashire I paid a few visits to working cotton mills. They were very similar buildings but they had bigger windows and were less oppressive. And there were less heatwaves! 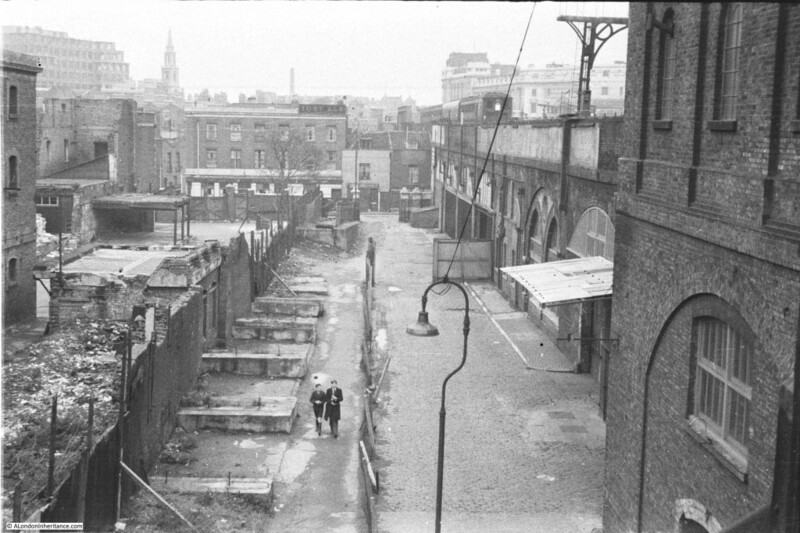 Also nearby between Stamford Street and the Waterloo terminus was a pub which was under the arches of the railway that led to Charing Cross. I think the Hole in the Wall is still there but it has to be different to what it was. It’s the only time where I’ve been in a pub and been asked for some spare change for a cup of tea! I guess that was the script for outdoors and the customers didn’t have the ability to adapt it! Great pictures, gives me a sense of where my ancestors lived and the type of area that it was. My grandmother lived at 63 Cornwall Road, and had a grocers shop. My ancestors have lived in Doon Street and Howley Place too, My uncle had a stall in Lower Marsh, and his son had an electrical shop there too, so my mum’s family are real Londoners! Interesting snippet about Dr Minor and his contribution to the OED. By pure co-incidence there’s an article in today’s Sunday Times that mentions him… although not by name. So this post has added yet another key piece of historical information to my knowledge! Great post. My father was born at 26 Tenison Street in 1915 and I’m always looking out for more information. My Grandmother was born in Tenison ST. approximately 1870. I cannot remember the number. I have walked the area but was frustrated that it was so difficult to pinpoint where Tenison ST. would have been. The work that has now been done is great and I will return with strong sentimental feelings. Her family were lightermen on the Thames going back generations and if anyone can give me information on how to track this fascinating existence I would be grateful. My Grandmother was born in Tenison St circa 1870 but I do not know the number. Her maiden name was Ellen Gosling. The family were lightermen going back generations. I would welcome any more information. My Grandmother Ellen was born in Tenison St circa 1860/70. Her family were Goslings and had been lightermen on the Thames for many generations. Her step brother Harold Gosling became a labour MP and was the first Minister of Transport. He was well known for forming the general workers trade union, prompted by the poverty and squalor he had witnessed on the river. 1951 aged 7 , I was taken to the Festival of Britain and told that I was standing where my Grandmother had been born. The newest buildings in York Road have changed the area yet again – giant towers that make the 1950s buildings look almost quaint.